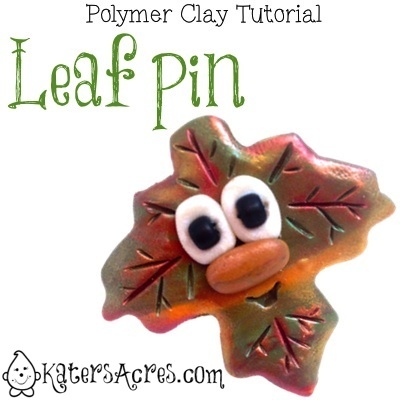 This cute polymer clay tutorial will give you the basics that you need to recreate this cute little leaf pin. Perfect to wear this season. You can also attach this to ribbons on a gift! ENJOY! NOTE: I used scrap clay. Run your clay through your pasta machine at a medium thick setting. Using your maple leaf cutter, center your cutter over a pleasing spot in your blend. Gently push your cutter through the blend. Take your fingers and gently pinch the leaf on the edges to help remove the “cutter” appearance (upper right). Using a contrasting color, roll a small ball of clay into an oval. Place the small oval onto the leaf as a nose. Roll two small balls of white or pearl clay to use as background for the leaf’s eyes. Insert two seed beads or other beads for eyes. NOTE: See how to properly insert beads into clay with this tutorial. Gently press your dotter into the clay and manipulate the clay to make a cute mouth shape. Using a needle tool, add the veining to the leaf. Add the veining by dragging the needle tool gently through the clay. NOTE: Think of how a leaf’s veins look and try to mimic that effect. Do NOT press the entire way through the leaf. When all the veining is added, gently turn the leaf over. Add a tiny amount of bake & bond (or liquid clay) to the back of the pin back. Add a small round of clay over the pin back. Blend the seams to secure into place. Add mica powder details to the front of the pin to highlight & accent. Depending on the type of clay used (premo, sculpey, cernit, kato, or pardo): bake in the oven at 265 degrees, covered in foil or a paper tent, for approximately 45-60 minutes. NOTICE: Check your clay package instructions for appropriate baking times & temperatures. Add a antique finish to pick up the details of your gorgeous piece! Varnish this piece with a clear coat varnish, being careful not to get the varnish on any beads or cogs. NOTES: You do NOT have to varnish this piece if you choose not to. However, if you have used Pearl-FX powders, they will rub off over time, so varnishing your piece would help. If you have used Perfect Pearls (my favorites) they contain a built in resin and are permanent after baking. In other words, they will NEVER rub off.